I’ve often been told that writers write in order to figure things out.That is definitely the case with this piece, in which I feel compelled to explore the current controversy surrounding the “Direct Drive” exhibit at the Contemporary Art Museum in St. Louis. 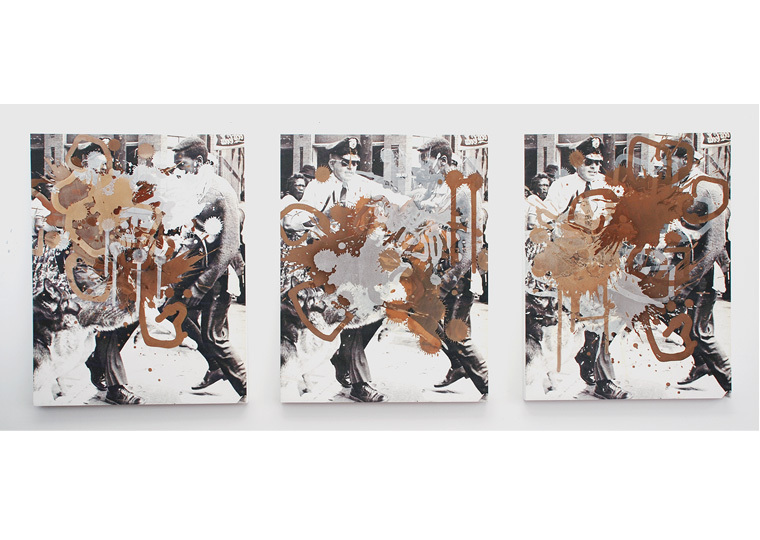 “Direct Drive,” an exhibit of work by Kelley Walker, features magazine photographs of black men and women that have been digitally manipulated and then smeared with chocolate and toothpaste. While other works by the artist are also on display, these images have triggered outrage and a public boycott of the museum. Many of the protestors are members of St. Louis’s black community; they have demanded that the works be removed and the museum issue a public apology for hanging them. Let me be clear: I am not an artist and I have no expertise in the art world. I have served as a docent at a sculpture park and somewhere along the way I took an art history class. I like art and I enjoy museums. In the current controversy, I am less troubled by the images than I am about the arguments. After visiting the exhibit, I came home with a copy of the gallery guide and tried to think critically about the controversy. Part of the problem between those who inhabit the rarefied atmosphere of the art world and us lesser mortals is, I believe, a problem of language. Artists and those who write about their work often use “art speak”—-a version of the English language that seldom clarifies, and often muddies, the water. Therefore, when the gallery guide says that “Walker creates gestural abstractions and alludes to consumption, objectification, and impermanence,” many of us remain confused. This was apparently an issue when the artist and a curator participated in a talk at the museum. The artist, who is white, was described as “hostile” when visitors inquired about his use of images of black civil rights leaders and black women on magazine covers. Is it important for artists to be able to explain their work? I don’t know. Some of the protestors complain that Walker’s images are “offensive” and “disrespectful.” While I acknowledge these feelings, I also wonder: are works of art supposed to be non-controversial? Is the purpose of a painting to show respect? If so, to whom—-the model on the canvas? the viewer? What about respect for the artist’s vision? Shouldn’t he be allowed to express it? British painter Lucian Freud once said that “the task of the artist is to make the human being uncomfortable.” If that is the goal, then Walker has succeeded admirably. Another complaint about this exhibit is that it is being shown in St. Louis, a city that has experienced racial unrest in the wake of Michael Brown’s death. Does place matter where art is shown? If the answer to that is “yes,” then a lot of cities (Baltimore, Chicago, Charlotte) will be eliminated from Walker’s prospective venues. It might be argued that art lovers in these cities would be even more receptive to discussing and critiquing his work. I don’t know how to respond to this work, any more than I knew what to think about Chris Ofili’s “Black Madonna,” a painting of the Virgin Mary decorated with dried elephant dung that was produced in 1999 (and later sold for $4.6 million). I don’t know if works of art have to have “meaning” or if it’s enough for them to stand on their own, without explanation. I don’t know if the powers that be in the art world are exhibiting “lily white ignorance” of issues that might inflame their communities. I do know that violent and painful images abound in the art world, and some people may be offended by almost anything. In an attempt to avoid offense, the Contemporary Art Museum found a solution that will probably satisfy nobody. It is erecting barriers to shield viewers from the offending works; the barriers will feature signs that explain the objections to the work and museum-goers can decide for themselves what they want to see. While this controversy has been difficult for the artist, painful for the protestors, challenging for museum officials, and somewhat baffling for the rest of us, it is probably ultimately good for the city of St. Louis. It has made some of us think and question our assumptions about art. It has probably increased attendance at the Museum. It’s given some of us something new and different to protest. And it’s quite possible that the situation will end up saying more about St. Louis and its citizens than it ever does about Kelly Walker his work.